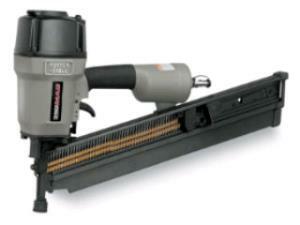 This Porter Cable framing nailer uses standard 22° plastic collated full-round head stick nails. It can handle sizes from 2 3/8" - 3 1/2", and features a lightweight magnesium housing, nail lockout mechanism, and bypass nail pusher which allows for easy reloading. * Please call us for any questions on our framing nailer pnuematic rentals in Hillsdale and Ridgewood NJ.